I am frequently asked for advice on the redecoration of historic structures. This may be by local authorities, heritage bodies or residents concerned at intended development in the area. As part of the recently announced £2.5 million makeover of Saturday Market, the Grade I listed Market Cross was in need of a repair and a repaint. The Cross was designed by Theophilus Shelton of Wakefield and built between 1711 and 1714. It was constructed at the expense of the then MPs, Sir Charles Hotham Bart and Sir Michael Warton. 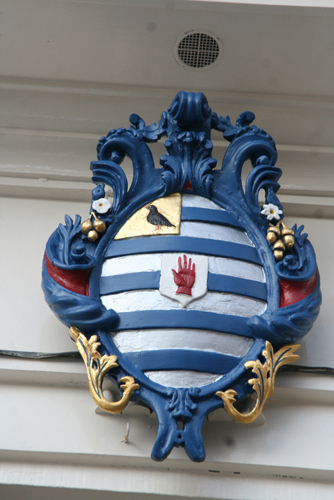 The cross displays their coats of arms as well as well as those of Beverley and the Royal Arms of Queen Anne. Before offering suggestions on the use of colour for the body of the Cross I focussed on the heraldic shields themselves. I was mindful that on a previous project – on the arms above Dudley House, in Park Lane, London – two of the nine quarterings had been incorrectly painted and families with no connection to the Dudleys had been indicated. The last thing that anyone wanted was for the same kind of mistake to be made in such a public location. 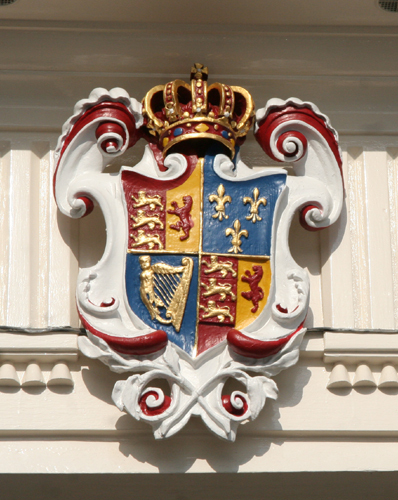 A whole language has developed to describe the appearance of heraldic arms (the shield). With this blazon the reader can reconstruct the appropriate image. 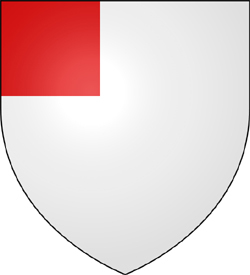 As an explanation – when the shield is patterned with a number of horizontal (fesswise) stripes, this is described as Barry e.g. of six or eight, usually of a colour and metal specified, e.g. 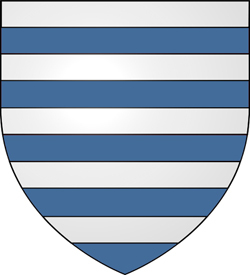 Barry of six Argent and Azure (this implies that the chiefmost stripe is Argent and the second is Azure – i.e. silver and blue). A Canton is a square charge placed in the upper dexter corner (a small device in the top L/H corner – looking at the shield). 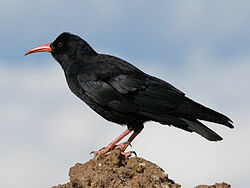 A Cornish Chough is a type of blackbird and Proper means in naturalistic colours i.e black. 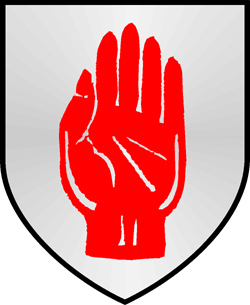 The red hand on a shield in the centre is the sign of a baronet. The order of baronets was created by James I in order to raise money. Nominally this was for the upkeep of military forces in Ireland, hence the badge of the Red Hand of Ulster featuring as a baronet’s device. At the same time the Red Hand is not invariably shown in a baronet’s coat of arms. 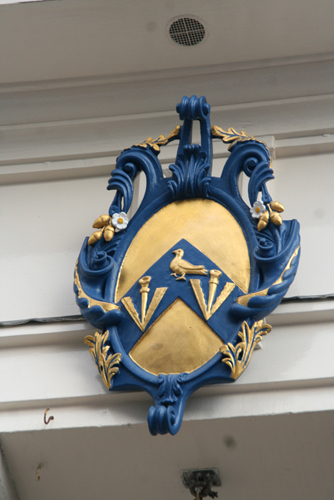 This indicates that a blue chevron is placed on a gold background and that on the chevron is a gold martlet between two broad arrow heads. 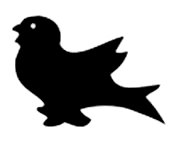 A martlet in English heraldry is a heraldic charge depicting a stylized bird similar to that of a house martin or swallow, though missing legs. 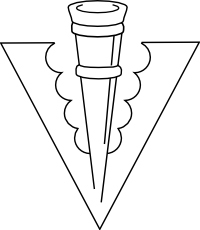 A pheon or broad arrow is a type of arrow with a typically flat barbed head. So far these three arms had been correctly painted, but it was when I examined those of Beverley itself that I realised there had been an earlier mistake. In the photograph that was sent to me the arms of Beverley appear to have a chief of Gules (red). In heraldic blazon, a chief is a charge on a coat of arms that takes the form of a band running horizontally across the top edge of the shield. 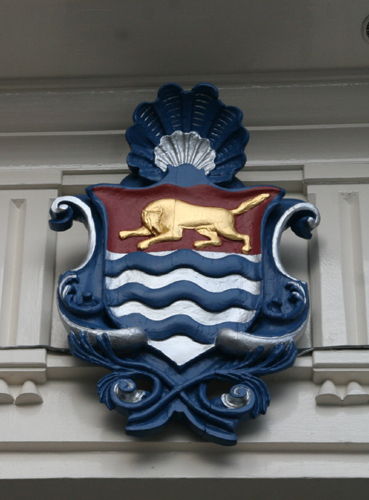 From what I gathered the shield is that used by the former Beverley Borough Council and that it was registered as a seal device without colours in 1584. 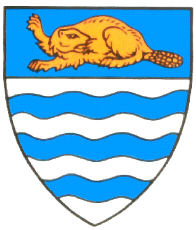 The beaver and waves were an obvious interpretation of the old form of the name ‘Beverlac’. Castor is the scientific name for the beaver. Regardant indicates an animal with its head turned backward, as if looking over its shoulder. 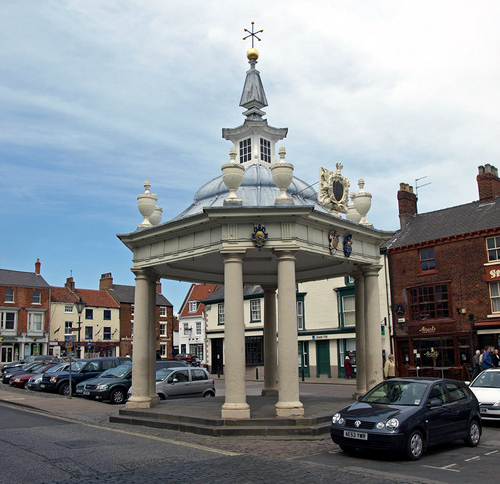 I look forward to the Market Cross being restored and becoming, once again, the focal point in Saturday Market, Beverley. Next year (2014) will be its 300th anniversary. 1 Sir Nikolaus Pevsner and David Neave Yorkshire: York and the East Riding Yale University Press. 1995. 280. 4 K.A. MacMahon. ‘The Building of the Beverley Market Cross’ in Transactions of The Georgian Society for East Yorkshire. 1952-1953. 80-98. I am particularly grateful to Professor John Wilton-Ely, who has been of enormous assistance. 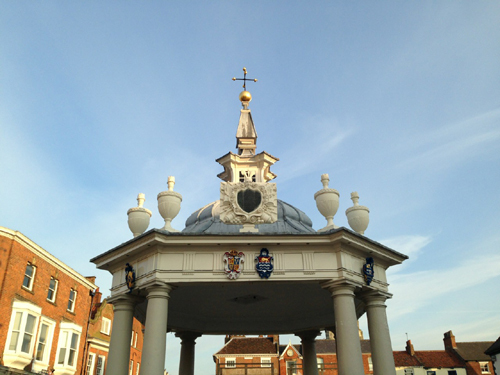 I would also like to thanks Andy Marshall who sent me a snap shot of the Market Cross. Allcvery fascinating. I have a burning question for you. 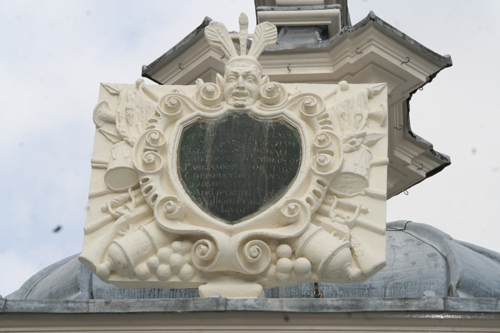 Do you know the two brass plates in the pavements near the market square with a thimble design embossed on them? They are on each side of the road. I wondered if you might know the origin of these and why they were installed there. I cannot find any reference to these anywhere. I hope you can clarify this for me. Thanks Don. I am afraid that I have no idea what these are. Have you tried asking the local tourist information centre? Many thanks Peter. You may well be right. Anyway, the finished result is a major improvement.